BOINC downloads programs over the Internet and runs them on your PC. You may be concerned that BOINC could be exploited by hackers to run malware on your PC ("malware" is software that does malicious things such as stealing private data). Is BOINC safe? The short answer: in practice, yes. After 8 years, running on millions of PCs, there have been no security incidents due to BOINC. How BOINC eliminates the most obvious risks. How you can reduce the remaining risks. Suppose you volunteer for a project, and hackers break into that project's server and replace its programs with malware. Will the malware be downloaded and run on your PC? BOINC uses a mechanism called code signing that makes this impossible, as long as projects use proper practices. Code signing is based on *public-key cryptography*. Each project has a code-signing key pair consisting of a public key and a private key. The public is sent to your client when you add the project. The private key is used to create "signatures" for programs. The BOINC client will only run programs with valid signatures. Projects are instructed to keep the private key only on a computer that is never connected to a network, and that is physically secure. This computer is used to create signatures. As long as these instructions are obeyed, hackers cannot sign malware, even if they break into the project's server. Therefore they cannot trick BOINC into running malware. Most BOINC projects follow these practices. However, some projects are lazy and keep their code-signing key on network-connected computers. This undermines the mechanism. So, if you're concerned about security (and you should be!) don't attach to a project unless it can convince you that it follows the code-signing procedure correctly. Ask project administrators to describe how they do code signing. BOINC's second line of defense is called account-based sandboxing. Operating systems (Windows, Mac OS X, Linux) have a notion of user accounts. 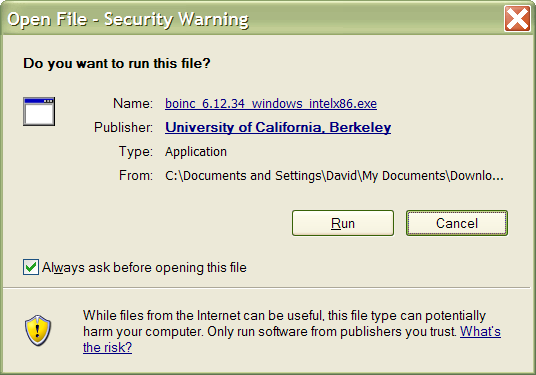 Each file and running program is associated with a user account. An unprivileged account is one that has access only to its own files; a program running under such an account is not able to access or modify any other data on the computer. BOINC can be configured to use account-based sandboxing - that is, to run project applications under an unprivileged account. This is the default on Android, Mac OS X and on the installers provided by Linux distributions. Currently, it is not the default on Windows because GPU applications can't run under unprivileged accounts. However, you can enable it on Windows by checking the Protected execution mode or Service install box during installation (depending on the version of BOINC). An even stronger form of sandboxing is provided by a technology called virtual machines. Programs running in virtual machines cannot access any files on your computer. Currently only one project (Test4Theory, from CERN) uses this technique. Rogue projects: the web site claims to do good-of-humanity research, but its programs are malware. Spoof projects: the web site mimics that of an established project, but its programs are malware. BOINC provides some protection again rogue and spoof project: the projects shown in the BOINC Manager's Add Project dialog are known to us (the BOINC project) to be legitimate. If a project claims to be academic, its URL should be in the .edu domain (or its equivalent outside the U.S.). If a project claims to be from an institution such as a university, you can contact the institution to verify this. Go on the BOINC message boards, see what other people say about the project, and see how long it's been operating. The above mechanisms assume that your BOINC client software is valid. What if hackers break into the BOINC server and replace the BOINC installers with malware? (Note: the version number may be different). This verifies that the installer is valid. On Linux, code signing is not used. For the ultimate in security, you can build everything yourself. BOINC is open source software. You can download the source code, inspect it, then build it for your computer. In addition, many BOINC-based projects make their application source code available. You can download and inspect the source code from their web site, build it for your computer, then use BOINC's Anonymous platform system to run the resulting executables from the BOINC client. This page was last modified on 21 July 2013, at 03:53.